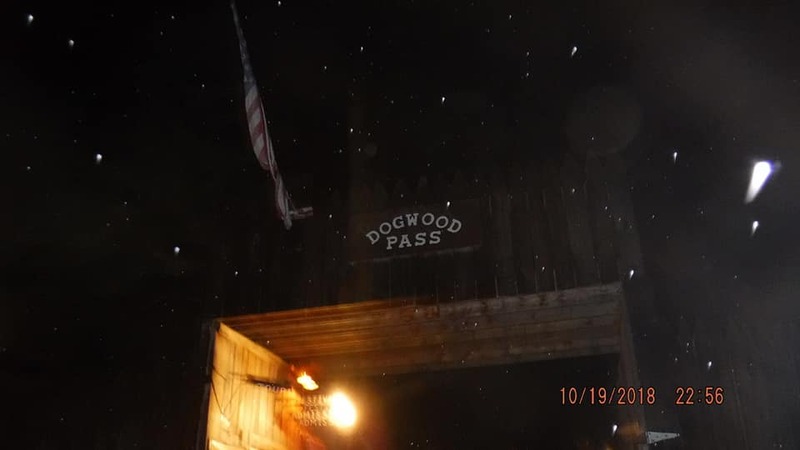 Horror at Dogwood Pass is a Haunted Attraction located in Beaver, OH. 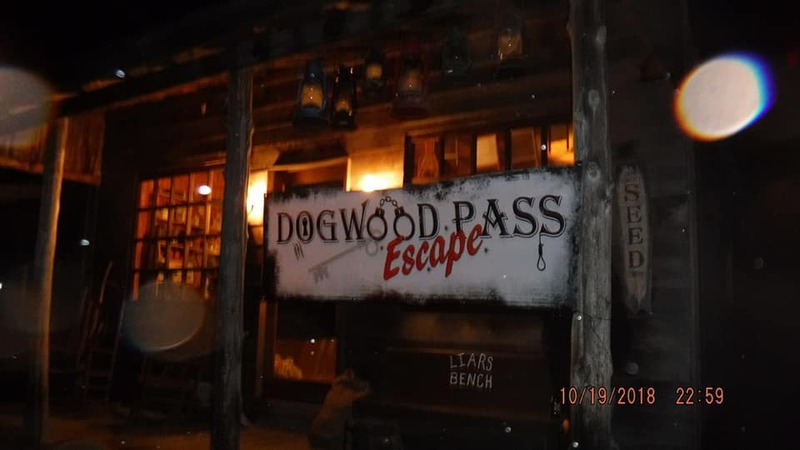 Horror at Dogwood Pass is a highly detailed replica of a Wild West Town. 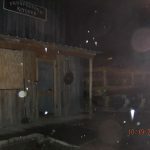 The amount of love and detail that has been put into recreating each building is incredible and provides a unique backdrop for this haunted attraction. 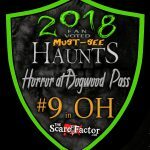 Normally, it is the home to high noon showdowns and simulated life in the old west but in October, Dogwood Pass transforms itself into a ghoulish landscape full of nightmarish creatures and townsfolk that have seen better days. Dysentery is the least of your worries on your voyage through Dogwood Pass. Just pray that you don’t meet a Donner Party-style fate. They have added an escape room this year that you can test your skill at for an extra $10. 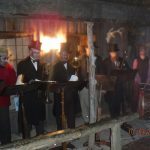 Dogwood Pass is open throughout the year and when it isn’t all gussied up for Halloween, it is awing visitors with its beautiful Christmas light displays and, of course, their realistic shows depicting life in an Old West Town. We would highly recommend checking this place out several times a year to take advantage of all the love and attention that they have put into this amazing attraction. 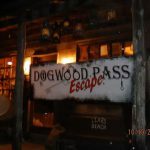 Dogwood Pass has the advantage of being a year-round style attraction and, as such, didn’t seem to be falling prey to the same actor woes that we have been seeing this year at other haunts. The place was very packed with actors portraying everything from zombies and marionettes to Freddy Krueger, Michael Myers and even the devil himself. When the denizens of Dogwood Pass aren’t spooking it up during the Halloween season, they are donning their wool trousers and petticoats to portray life in the old west. These folks are dedicated to Dogwood Pass and it shows. They are well adept at sinking into a role and staying there. 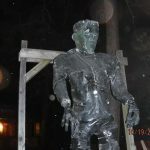 They are clearly used to interacting with visitors and carrying off a character, even if their grip on the scary side of things doesn’t seem as firm as it should. While the characters weren’t always scary, they were definitely entertaining and quite able to carry on a conversation if you were brave enough to engage in one. You won’t be touched here, but there are some rather imposing characters that aren’t afraid to creep inside your personal bubble to add a nice level of fear. Dogwood Pass is used to costuming for an authentic Wild West theme, but are still honing their skills when it comes to haunt garb. A large portion of their actors are in highly detailed costumes while a few others had that “last minute” look and could have used some help. Makeup is a hard category to judge when it is pouring down rain outside, as most makeup doesn’t really hold up well in the rain. 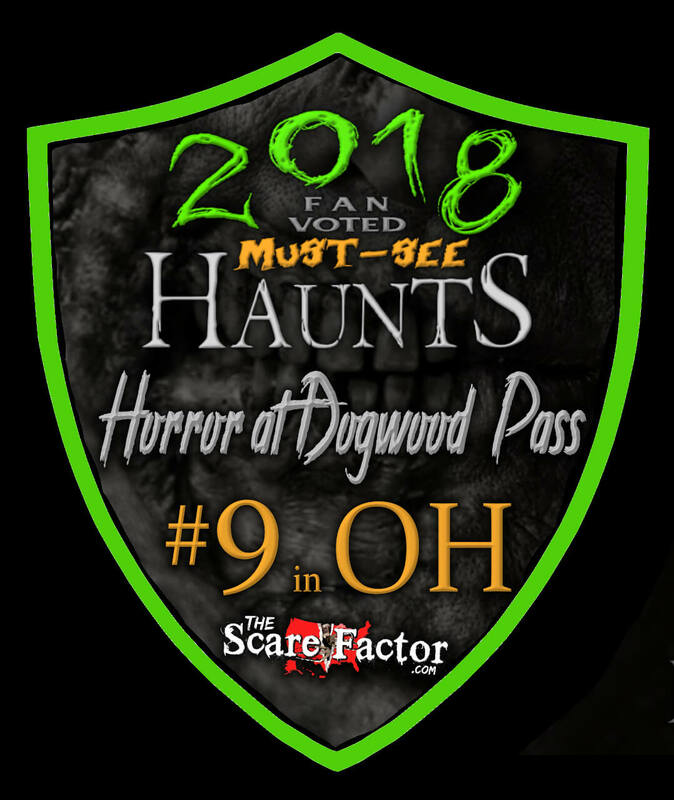 However, based on the makeups that we saw on characters lucky enough to have an indoor position, Dogwood Pass would benefit from bringing on a couple of seasoned haunt makeup artists. The makeups weren’t bad but, could have certainly used some tweaking to bring the most out of the characters. There are several high-quality masks used here to depict characters like Freddy Krueger and Michael Myers, and they were worn very well. The actors inside the masks worked very well through them and the ones portraying iconic characters did so skillfully. 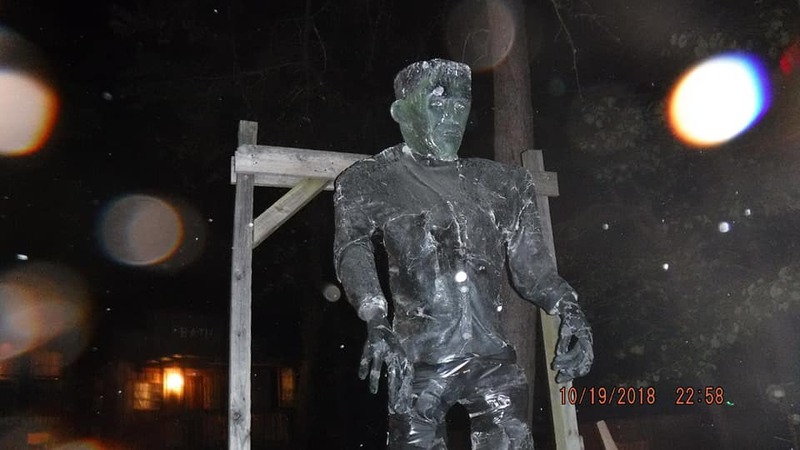 We could believe that we were face to face with the Boogeyman or the Elm Street Slasher. GPS will take you directly to Dogwood Pass, but there isn’t a lot of signage on the way. There are a few unlit signs as you get real close and, if you’re using Google Maps through your phone, be warned that there is a good chance that you will lose signal quite a bit along your journey there. But, once you are there, the staff will greet you with a smile and are happy to answer any questions you have. We got our tickets and were escorted up to the queue area by a delightful young lady with arms sticking out of her head. 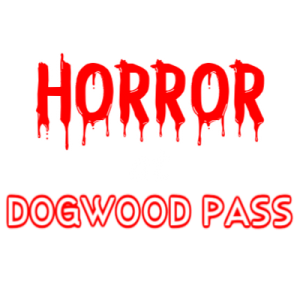 If you want information about Dogwood Pass, it’s not hard to find between their Facebook page and website which has a really nice interface for mobile. Last year, they had a couple of port-o-potties out front for patrons to use however, we did not see those this year. There are probably restrooms available, we just didn’t notice them and failed to ask. Dogwood Pass is an authentic replica of a town in the old west and, as such, does not have concrete sidewalks or paved roads. There is a lot of uneven ground here and plenty of steps. Before you enter, they warn you about that and about the fact that there are some low beams and places where you’ll need to duck. They are relatively safe, however, there are a few places that we felt were a little iffy beyond the standard warning. In one location, they have a really cool bridge effect with a step down as you exit it and there is an actor at the end ready to scare you as you do. In another area, there is a ramp up to a building with the boards attached lengthwise. A few of the boards are pretty soft and, if stepped on just right, could lead to someone twisting an ankle and falling. Overall, it is a safe place as long as you are careful and pay attention. The queue area at Dogwood Pass is the town center. There is a cute little outdoor “movie theater” and you stand there in the brisk autumn air, surrounded by various buildings that are slightly decorated in Halloween fashion with props glaring down at you from the windows. 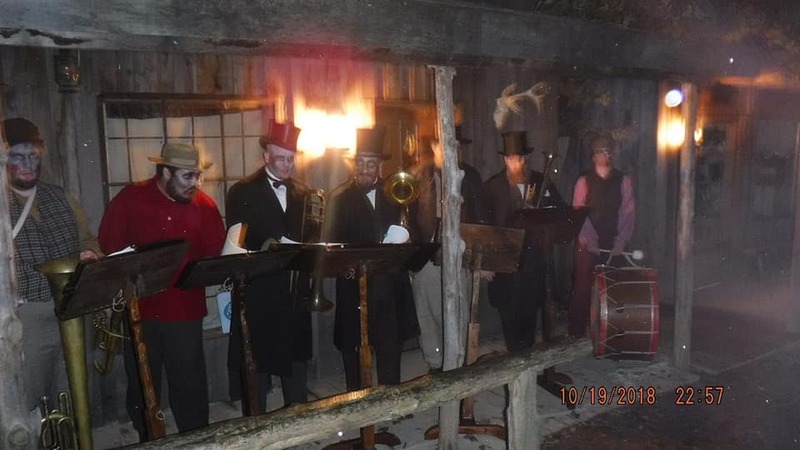 One very unique feature this year was the addition of an old brass band playing from a nearby sidewalk. It wasn’t the standard heavy metal or Midnight Syndicate audio that you get at most haunts, but that is what we liked about it. Their sounds complimented the town’s setting and added an unexpected level of creepiness. 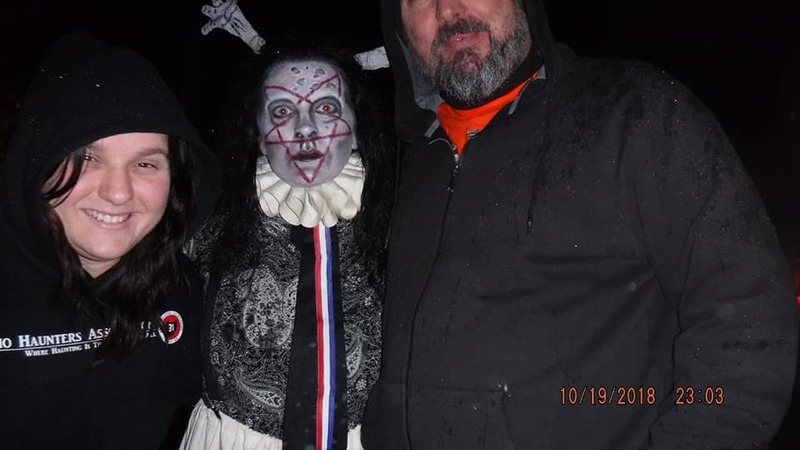 The laid back environment in the queue area was a stark contrast to the energy felt inside the haunt itself and lures you into a false sense of security. 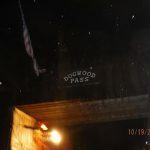 Dogwood Pass was in the middle of expanding their haunt this year and didn’t quite get everything done prior to opening. With that being said, if what we experienced was their effects at “halfway,” we are looking forward to seeing this place again next year. Many of their sets are highly detailed and can transport you to another place in time. Unfortunately, there were also a lot of rooms that weren’t quite finished and a lot of black plastic mazes which allows you to slip out of the fright mindset and realize that you are just walking through black plastic. They have some really cool and unique effects that we don’t see at a lot of haunts that will either terrify you on have you laughing (usually at yourself). We didn’t notice a single theme as we made our way through. Prepare to get scared here. These folks are really good at garnishing screams from its patrons by attacking high, low and everywhere in between. Their use of distractions is on point, utilizing other actors or props in the area to get your attention while they attack out of nowhere. They also are not afraid to make anyone their victim, so all you big and burly men out there will not be finding safety in your size. The finale is a bit lax though and left us wondering if it was really the end. It will cost you $15.00 to make a trek through Dogwood Pass, but it will take you about thirty minutes to do so which puts their minutes per dollar value at a remarkable 2! There is also so much to just ogle at around the town itself that makes the trip well worth the ticket price. Our biggest regret is that we don’t live much closer so that we could visit more often. This place is breathtaking and definitely worth a visit during any time of the year. 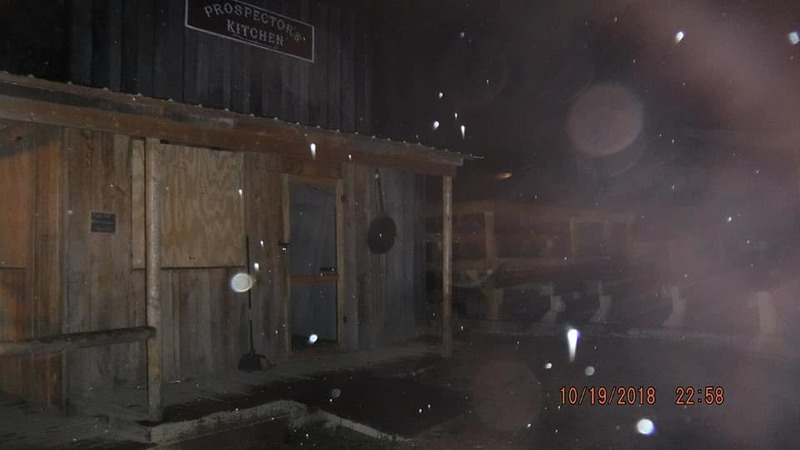 My best friend and I had to get to Dogwood Pass after visiting another haunt across the county, she …show more had been before and I hadn’t. When we got there it was very close to closing time. This made for an extra special experience for us! Once we arrived, my best friend made it known that I was super scared of clowns. So with that said, as we entered the town, the wife of the owner asked my name and then screamed it to the actors in the town. TALK ABOUT SPOOKY!!! Every step we took, I heard stuff like “TINA IS HERE! FRESH MEAT” or “WANNA PLAY, TINA? ?”or even things like “TINA IS HERE, TIME TO PLAY!” And since we were the only two going through the town at that time, It was super awesome for me! The clowns would NOT let me out of the room until I hugged one of them (meanies). But It is a MUST SEE attraction! The actors are local actors and love what they do!